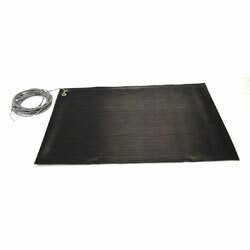 Vinyl, heat-sealed mats have a 25-foot cable (bare wire termination). Mats require 5 pounds nominal pressure for activation. When paired with the Economy Clock Counter, Model 54060A, this small switch mat is perfect for the stair test. For more information about the Economy Clock Counter, view RELATED PRODUCTS.